Himachal Pradesh Cabinet in its Meeting held here today granted permission to fill up 200 vacancies of Medical Officers in the Health and Family Welfare Department with a view to strengthen the health services network in the State. Out of 200 posts 125 posts shall be earmarked for Medical Officers with Post Graduate Degree and balance 75 for Medical Officers with MBBS Degree. Chief Minister Prem Kumar Dhumal presided over the Meeting. Cabinet approved to increase contractual pay of different categories of para medical staff appointed in Health and Family Welfare Department through Rogi Kalyan Samities by 40 percent. Senior Laboratory Technician will now be getting Rs. 10,500 per month instead of Rs. 7,500; Radiographer to get Rs. 9,500 instead of Rs. 6,825; Operation Theatre Attendent to get Rs. 7,000 instead of Rs, 4,995; Medical Social Worker to get Rs, 12,200 instead of Rs. 8,700; Child Psychologist to get Rs. 15,150 instead of Rs. 10,830; Physics Technician to get Rs. 10,500 instead of Rs. 7,500; BT Health Visitor to get Rs, 9,250 instead of Rs. 6,000 and Physiotherapist to get Rs. 11,500 instead of Rs. 8,220, per month they were getting earlier. It was also decided to provide 3 percent annual increment to the contractual employees in the Panchayati Raj Institutions. This is in fulfillment of the Budget Announcements made by the Chief Minister. Cabinet decided to recruit 142 drivers in Himachal Pradesh Road Transport Corporation on contract basis and also relax upper age limit in favour of 16 applicants who at the time of interview were otherwise eligible for the post and now crossed the recruitable age limit of 45 years. It was decided to enhance the pay of Post Graduate doctors. First Year Students will now be getting Rs. 25,000 instead of Rs. 15,000; Second Year to get Rs. 27,000 instead of Rs. 16,000 and Third Year to get Rs. 30,000 instead of Rs. 17,000 per month they were getting earlier. Similarly Senior Resident (Post PG) of First Second and Third Year will now be getting Rs. 40,000, Rs. 42,500 and Rs. 45,000 respectively per month instead of Rs. 35,000 they were getting earlier. Interns of the Government Medical and Dental college will now be getting a monthly scholarship of Rs. 8,000 per month instead of Rs. 5,000 they were getting earlier. It was decided to fill up 18 posts of Operation Theatre Attendants and One Neurologist in IGMC, Shimla. Cabinet decided that in addition to the earlier provisions of giving preference to the widow and orphan dependants applicants, widow or dependent(s) children of the government employee expiring before the age of 50 years shall also be given preference in compassionate employment. In case the family pension to the family of the deceased government employee is less than Rs. 3,000 per month, then the dependent(s)/Children would also be given priority along-with the widow. It was decided to increase the grant being provided for purchase of sewing machines to the beneficiaries of different categories by the Department of Social Justice and Empowerment from Rs. 1,300 to Rs, 1,500. It was also decided to provide a bimonthly fixed Mobile Phone payment of Rs. 350 under CUG Plan of BSNL to all Medical Officers working on regular basis w.e.f. April 1, 2012. This is in fulfilment of the Budget Announcement of the Chief Minister. 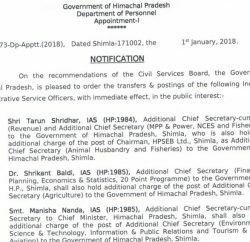 It was decided to fill up 6 posts of different categories in Himachal Pradesh Technical University, Hamirpur and also appoint Director-Principal in Atal Behari Vajpayee Government Institute of Engineering and Technology, Pragatinagar, Shimla. 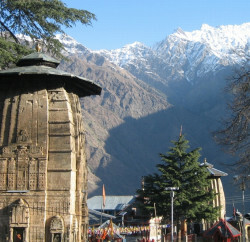 It was approved to accept the recommendations made by High Power Committee constituted by the State Government for managing the affairs of religious institutions in the State and decided to uphold the management of temples as per the tenets of Hinduism, constitute Councils, provide security, online ‘Pooja’ and offerings, utilize acquired vacant space around the temples, provide for uniform recruitment and pay structures to employees of the temples notified by the Government. It was decided to provide enhanced Government Guarantee of Rs. 8.00 crore instead of Rs. 5.00 crore earlier in favour of HPMC. It was decided to lease out land at Nurpur in favour of Himachal Pradesh Cricket Association for 30 years for construction of a Cricket Stadium. It was decided to accept the proposals of State Apex Committee with regard to roll-out of Lok Mitra Kendras throughout the State and authorize Information Technology Department to enter into Supplementary Agreement with SCAs in line on revised proposal. It was approved to provide facility of e-filing of returns and e-payment of tax-amendment in Himachal Pradesh Tax on Luxuries (in Hotels and Lodging Houses) Rules, 2012; Himachal Pradesh Taxation (on Certain Goods Carried by Road) Rules, 2012 and amend Central Sales Tax (Himachal Pradesh) Rules, 1970 to allow declarations Forms online. It was approved to exempt entry tax on newsprint used for printing of newspaper in the State during next financial year 2012-13 in larger public interest and also reduce Entry Tax rate on non-ferrous metals from ½ percent to 1.4 percent. This is in fulfilment of the Budget Announcement of the Chief Minister. It was approved to reduce VAT from 13.75 to 5 percent on sweetmeats and milk products prepared and sold by manufacturers, milk federations and co-operative societies located in the State; levy concessional rate of 4 percent VAT on goods sold by Central Police Canteen exclusively to their serving and ex-serving personnel and exempt VAT on idols (Statues) made of marbles for temples and places of worship by public at large and increase VAT on cigarettes and other tobacco products, excluding beedies from 16 percent to 18 percent and on beedies from 9.75 percent to 11 percent. This is in fulfilment of the Budget Announcement of the Chief Minister. It was approved that contractors of C and D class having annual turnover of Rs. 30 lakh and who have paid TDS @ 3 percent will not be required to file any return for that year. The tax deduct at source will be deemed to be a final payment and no assessment of these contractors will be required. The turnover limit for registration and exemption for payment of tax for small entrepreneurs running dhabas, canteens and other eatables had been raised from Rs. 4.00 lakh to Rs. 5.00 lakh per annum. This again is in fulfilment of the Budget Announcement of the Chief Minister. It was decided to make HP Nurses Registration Act, 1977 provisions more stringent to prohibit un-registered person from unlawful practice, impose penalty for fake assumption of title of registered incumbents by enhancing the quantum of penalty besides imprisonment from six months to two years so that number of violation cases is reduced substantially and it becomes more beneficial in providing better nursing services in the Health Institutions. It was decided to approve Himachal Pradesh Disaster Management Policy, 2011 for implementation in the State. It was approved to up-grade and re-designate 5 posts of District Tourism Development Officers to Deputy Director in Tourism and Civil Aviation Department. It was approved to amend the Regulations for all Private Universities set up in Himachal Pradesh. It was approved to amend the Recruitment and Promotion Rules for the Post of District Public Relations/Information Officers (Class-I Gazetted) in the Department of Information and Public Relations. Approval was granted to Amend para 2 of Section 18 of the Shimla Road Users and Pedestrians (Public Safety & Convenience) Act, 2007. It was decided to approve the Report of Comptroller and Auditor General of India for the year 2010-11 and table the reports pertaining to Himachal Pradesh during ongoing session of HP Legislative Assembly.